Greymist stands just under 46" and weighs around 340 pounds. She immediately chose Jim as her partner before we even started the process of choosing her. Greymist has the kind of curiosity that makes her fun and rewarding to play with. 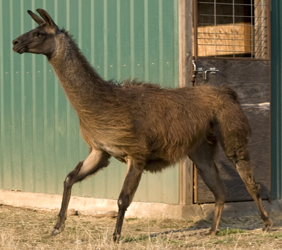 We thought we were through adding breeding females to our herd for the foreseeable future, but ... Bobra Goldsmith repeatedly insisted that she owed us a replacement female after Kiowah gave birth to a cria with choanal atresia (now that’s a truly ethical breeder and friend!). When we visited Bobra in the summer of 2000, we were quite taken with Greymist and were pretty ecstatic when Bobra decided she could part with her. Greymist has an athletic, well-muscled body wearing a stupendously wonderful Classic coat, which she has passed on to all but one of offspring. She's not perfect, though — she kicks reflexively, and very hard, too — a trait that's definitely inherited from her sire. Greymist came up severely lame in her left foreleg just a few weeks prior to Teewinot’s birth, and she has retained some minor disability from that mysterious incident, so she is a permanent homebody now. Between having several upgrade offspring and the discovery of Teewinot's umbilical hernia, the decision to retire her from further breeding and not find out the hard way if pregnancy would aggravate the injury was a no-brainer. Greymist likes getting into things — particularly forbidden things — and also appreciates going for walks (or, as she sees it, adventures). And dessert (apple pieces or Apple-Asses®) ... life is short, she says; more dessert! Greymist’s name is no doubt a reference to her color (grey-brown, or dun).